YOUNGSTOWN, Pa. — Ken Reed sat down at the main bar of the Tin Lizzy tavern with two things in mind: to dig into the tavern’s oversize cheese steak, and watch the presidential debate. “I am hungry and undecided, in that order,” he said, digging into the savory dish in a bar that dates back to 1746. Kady Letoksy, a paralegal by day, a waitress and bartender at night at the Tin Lizzy, sat beside him. At 28, she has never voted before, and she is now thinking it might be a good idea to start. Letosky entered the evening undecided in a town that is heavily Democratic in registration. Her sister and father are on opposite sides of the political aisle. Donald “Trump had the upper hand this evening,” she said, citing his command of the back-and-forth between him and Hillary Clinton. Reed, 35, is a registered Democrat and small businessman. “By the end of the debate, Clinton never said a thing to persuade me that she had anything to offer me or my family or my community,” he said, sitting at the same bar that has boasted local icons as regulars, such as the late Fred Rogers, and Arnold Palmer, who had his own stash of PM Whiskey hidden behind newer bottles of whiskey for his regular visits. “Have to say Trump had the edge this evening, he came out swinging but also talked about specifics on jobs and the economy,” Reed said. Reed said Clinton came across as either smug or as though she was reading her résumé, adding there was nothing on her résumé that touched on his life. “I am a small businessman, a farmer, come from a long line of farmers and coal miners. The policies she talked about tonight ultimately either hurt me or ignore me,” he said. How apropos for this presidential election that these patrons chose the Tin Lizzy — a 270-year-old tavern in this small Westmoreland County town — as the place to watch the historic debate between Clinton and Trump. The tavern’s namesake is the Model T, the first affordable automobile available to America’s working class, which eventually became slang for something quite different. If someone said you were “going the way of the Tin Lizzy,” it meant your job or industry was in decline, no longer useful. That is how today’s cosmopolitan and political classes view Main Street voters — as people whose values, traditions, skills, jobs and lives are being replaced by something new. Pennsylvania is a high-stakes state for both candidates, but particularly Clinton, and Westmoreland is a high-stakes county, particularly for Trump. Hillary Clinton was boring and exceptionally well-prepared. Donald Trump was exciting but embarrassingly undisciplined. He began with his strongest argument — that the political class represented by her has failed us and it’s time to look to a successful dealmaker for leadership — and kept to it pretty well for the first 20 minutes. Then due to the vanity and laziness that led him to think he could wing the most important 95 minutes of his life, he lost the thread of his argument, he lost control of his temper and he lost the perspective necessary to correct these mistakes as he went. Methodically and carefully, Hillary Clinton took over. Her purpose was to show she was rational and policy-driven, the kind of person who could be trusted to handle a careful and delicate job with prudence and sobriety — and that he was none of these things. And she succeeded. By the end of the 95 minutes, Trump was reduced to a sputtering mess blathering about Rosie O’Donnell and about how he hasn’t yet said the mean things about Hillary that he is thinking. Most important, he set ticking time bombs for himself over the next six weeks. As she hammered him on his tax returns, he handed her an inestimable gift by basically saying he pays no federal taxes despite his billions — and moreover, that if he had done so, it would have been “squandered” anyway. By the end of the 95 minutes, Trump was reduced to a sputtering mess blathering about Rosie O’Donnell and about how he hasn’t yet said the mean things about Hillary that he is thinking. That’s not going to go away, nor is her suggestion that his refusal to release his returns is the result of his either not being as rich as he says or not being as charitable as he claims. Clinton quoted him saying in 2006 that he hoped for a housing meltdown because it would provide buying opportunities and thereby goaded him into saying “that’s called business, by the way.” To which she quickly replied that 9 million people lost their jobs and 5 million lost their homes in the housing meltdown he was so excited about. Blammo. His reply to Hillary’s recitation of the fact he’d begun his career settling a Justice Department lawsuit about racial discrimination in Trump housing was that there was “no admission of guilt,” which is the sort of thing the villain said at the end of “LA Law” and sounded no better in real life. Even when he could have taken her down, he was so incompetent he didn’t go for it. A question about cybersecurity was the perfect opportunity to hammer Clinton on her outrageous mishandling of classified information. Instead, he went into a bizarre digression in which he alternately wondered whether his son Barron might grow up to become a hacker and defended Vladimir Putin from the accusation Russia had tapped into the Democratic National Committee’s emails (which the FBI says almost certainly happened). That has to count as the biggest choke of his political life. By the time the last 15 minutes rolled around, he was reduced to yammering about Rosie O’Donnell being mean to him and Hillary running mean commercials about him and praising himself because there are some really terrible things he could have said about Hillary but hasn’t. By this point, even his smart closing zinger — “she has experience but it’s bad experience” — was buried inside a weird word salad that reduced its effectiveness to almost nil. His supporters should be furious with him, and so should the public in general. By performing this incompetently, by refusing to prepare properly for this exchange, by not learning enough to put meat on the bones of his populist case against Clinton, he displayed nothing but contempt for the people who have brought him this far — and for the American people who are going to make this momentous decision on Nov. 8. I don’t know if its being televised in NZ, but if it is, I’d definitely watch some of it. A new poll by Bloomberg Politics has given Republican presidential candidate Donald Trump a small lead over the Democrats’ Hillary Clinton going into Monday’s debate. 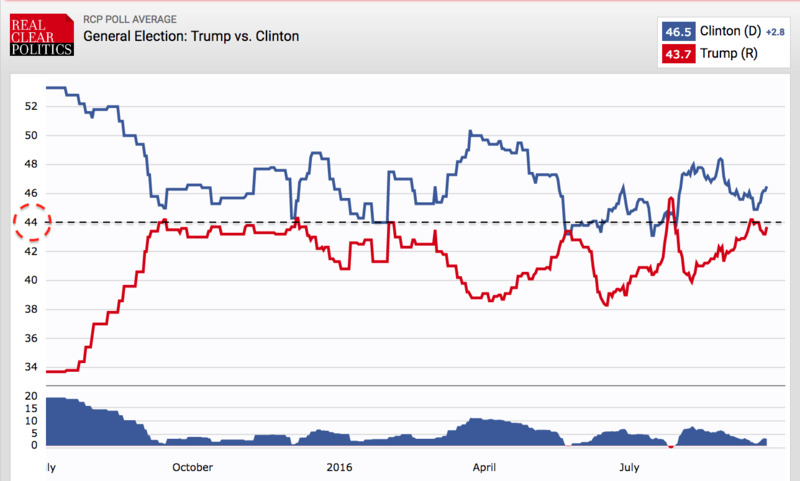 More significantly, it shows that Trump’s momentum since June’s low of 38.3% is still going. He has obliterated the lead Clinton held for the last three months. The chart does not include today’s poll. The Bloomberg result is significant because even it shows Trump is above the 44% level, which has previously been the uppermost ceiling of his support in a head to head split on RCP’s poll tracker. This is now the sixth time in the race that Trump has hit or broken through that 44% barrier. Paradoxically, the biggest source of white noise are economists. Much of modern macroeconomics is bunkum, which means that its findings and predictions contribute negatively to the sum total of human knowledge. Paul Romer, one of the world’s preeminent macroeconomists and a professor at the Stern School of Business at New York University, has made his own inflammatory contribution to this debate, and many are now being forced to address this critical problem. It’s devastating stuff, but Romer is right. Academic macroeconomic theory is broken – but so are the models used by central banks and the spreadsheet forecasting in the City. It’s an intellectual catastrophe. Thousands of intelligent, well-meaning economists are at best contributing noise to the debate and at worst leading governments, companies and investors down the wrong paths. Romer’s attack on macroeconomics , if anything, doesn’t go far enough. Progress had indeed been made by the 1970s, in particular as a result of Milton Friedman and Anna J Schwartz’s Monetary History of the United States, a book that Romer agreed was a scientific triumph. But the economic consensus – the majority view – keeps calling the big macroeconomic questions wrong. It failed to see the boom of the 1920s, it didn’t predict the Great Depression (those such as Ludwig von Mises or FA Hayek, who did, were ignored), it messed up disastrously during the 1930s on everything from the gold standard to the reaction to the Depression, before catching the pernicious Keynesian virus. It wrongly fell in love with central planning in the Second World War and in the 1960s Paul Samuelson’s best-selling economic textbooks were happily predicting that Soviet per capita income would soon catch up with America. On the greatest question ever – is capitalism or communism best – the economic establishment got it wrong. Not content with that, the consensus failed to see the stagflation of the 1970s coming (it was deemed impossible by simplistic Keynesians); 364 economists campaigned against Margaret Thatcher’s macroeconomic policies of the early 1980s (most still don’t get it); they didn’t spot the bubble of the 1980s or the subsequent housing crash and they backed the disastrous European Exchange Rate mechanism. It’s almost a case of take your pick – choose a disastrous policy and you can be sure that most economists backed it. In a poll in 1979, 65 per cent of economists said joining the euro would have been in the UK’s interest; that number rose to 73 per cent of among those specialising in the economics of the EU and of monetary union. Then they all missed the financial crisis, and they missed the recovery. More recently, the economic consensus (as against a few brilliant exceptions) also failed to predict everything from the collapse of inflation, the UK jobs boom to the productivity slowdown, not forgetting that many saw a non-existent double or even triple dip recession coming a few years ago. A month or two ago, the consensus was predicting immediate Armageddon, a Lehman-style freezing of markets, and in many cases a recession or numerous negative quarters of growth if we voted Brexit. It’s a woeful, abysmal record, one for which the very concept of “rewards for failure” was invented. So yes, Romer is right – and if anything, he doesn’t go far enough. So those seeking out alpha – when it comes to Brexit or anything else – need to tread carefully. They must weigh up the evidence, the claims and counter-claims on all issues. But the fact that 90pc of economic forecasters agree with something should be no more relevant than the latest phase of the moon. America is finally reaping what they have sown in Trump. This was my thought when I first heard that Trump was going to run for President and to date, my opinion has been reinforced. I have not researched the evidence, although in the past I am aware that various studies have found evidence that the average standard of education is dropping. Personally I see it everyday and everywhere. Basic arithmetic, reading and writing skills are so low as to be almost non-existent. Facebook and other social media are endemic. They are also unmitigated trash. ‘Txt’ spelling is about the level that can be achieved now. The work ethic is poor. I have more or less paid my way through law school based on the absenteeism at the weekend of staff. Professions, you would expect to be free from this deterioration in standards. Not the case. I went to court in a case where the senior solicitor, in her submissions pleaded the wrong clause of a contract, in case that was a ‘contractual interpretation’ case. This senior solicitor was in her thirties. All of the above can be traced to a systemic decline initiated through increased government interference with standards of all descriptions and the erosion of free market standards through decades. Trump is the embodiment of government failures come home to roost. He is the social media candidate, in a social media [intellectual] world. Clinton by contrast, who may actually be intelligent, will speak at a level that completely misses the level required in this election, to be elected. Add to that her questionable ethics and she may very well lose. This is the chap that should be US President. The trouble is that to really understand where he is coming from, you need to have put in a bit of study on Austrian economics and unfortunately, the US voting population that seemingly form the majority and are currently disgruntled, have not. While some of the platform falls well within the boundaries of traditional conservative doctrine – such as shuttering some federal departments and rewriting the federal tax code — other elements are harder to imagine a wealthy country in the 21st century enacting. Chinese “depreciation” and all its ensuing hysteria occurred just about a year ago. It has also been a about a year since I co-wrote a book on China with Worth Wray titled A Great Leap Forward? The title was meant to be ironic. The original Great Leap Forward was imposed by Mao in the 1960s. It was one of the most economically disastrous times in Chinese history. Food production increased, yet 30 million people starved. China underwent a true financial and economic crisis due to the insanity of central control of markets. China now attempts something that is as powerful in scope as Mao’s Great Leap Forward. It has amassed a huge amount of debt in its drive to enter the modern world. China has succeeded in becoming a major force. But those who are paying attention see the country’s debt growing at a phenomenal rate. It is much higher than the economy’s rate of growth, which is shrinking. That means the ability to service the debt is shrinking, too. And we are talking about massive amounts of debt in relation to GDP. There is a lot to like and appreciate about China. But it isn’t clear what they are going to do about their current circumstances. This includes the inevitable shift from being a manufacturing powerhouse to being a consumer powerhouse. It’s not an easy transition. My friend Michael Pettis is a professor at the Guanghua School of Management at Peking University in Beijing. I think it’s safe to label him a long-term China insider. He’s possibly the most knowledgeable person I know on China’s inner workings. Here is his latest article on the nature of Chinese debt and the problems that the resolution of that debt is going to create. I’ve always thought that Shirley Yam of the South China Morning Post has a great nose for financial risk, and this shows in an article she published last week on mainland real estate. For anyone knowledgeable about the history of financial bubbles and crises, much of the following story will seem extremely familiar. The point to remember is that what is normally recorded as business operations in activities described in the article, results in fixed payments that are inversely correlated with underlying conditions, and so is really no different than debt in the way it will begin to generate financial distress costs when the economy turns—goosing economic activity on the way up while exacerbating the contraction when it comes. This is how the system works. Say an apartment building costs 1 billion yuan to build. George will provide the developer 300 million yuan as “facilitation money” at an interest rate of about 4 percent to win the job. The latter will then give George 80 million yuan for the services rendered. George, however, does not have any shareholding in the project, whatsoever, to cover his back. Neither is he assured that the facilitation money would not end up in the stock market. All George can do is pray and hope that the apartments sell well and he gets his money back with interest plus the construction costs. Despite the risk, there has been no dearth of interested players. As George puts it, it has been getting worse. His state-owned rivals are now offering “facilitation money” of up to 50 or even 60 percent of the construction cost. Some are even pitching in with zero interest, while others are promising to help in eventual sales. The obvious question that comes to mind is why are developers willing to pay record amounts to own a piece of land—or as some suggest, pay more for the flour (land) than the bread (flat). But then the land parcels are not really meant to be the flour for the bread. A good case is China Cinda Asset Mangement, which has invested more than 61 billion yuan in property during the past 12 months. Among its acquisitions was a piece of land in suburban Beijing that was so expensive that it will break-even only if the property prices are four times higher. But Cinda has piles of liquidity to splash about. Its debt to equity ratio rose by a third to 368 per cent in 2015 and it paid just a quarter of the loan rate of its private rivals. For Cinda, property seemed the best bet. After all, the real economy was not going anywhere and the stock market was twisting and turning. On the other hand, property investment promised huge returns and was more self-fulfilling in nature. The record-breaking land prices support the property market and therefore the repayment of the multi-billion yuan of loans via shadow banking that Cinda and other state firms are loaded with. So overpayment seemed perfectly okay. Keep all of this in mind when thinking about stepped-up efforts to clean up China’s banking system. There has been a flurry of reports recently about steps taken to clean up the banking system, but from an economy-wide point of view, it is not clear that any reduction in debt burden’s for the banking system actually reflect a reduction in the debt burden for the economy as a whole. And anyway, new kinds of debt are growing quickly enough that even if it did, the country’s debt burden is almost certainly rising. The good news is that the capital raises have begun. The bad news is that they need to continue. An analysis of 765 banks in China by UBS Group AG shows that efforts to clean up the country’s debt-ridden financial system are well underway, with as much as 1.8 trillion yuan ($271 billion) of impaired loans shed between 2013 and 2015, and 620 billion yuan of capital raised in the same period. But the work is far from over, as to reach a more sustainable debt ratio, the Chinese banking sector will still require up to 2 trillion yuan of additional capital as well as the disposal of 4.5 trillion yuan worth of bad loans, according to the Swiss bank’s estimates. I think a lot of this misses the point, and not just because there is a lot more debt out there than we think. I think the optimism with which this news has been received reflects a failure to think systemically about the Chinese economy. The fact that bad loans overwhelm the capital of the banking system should not blind us to the fact that China’s problem is excessive debt in the economy, and not a banking system that risks collapse because of insolvency. The only “solution” to excessive debt within the economy is to allocate the costs of that debt, and not to transfer it from one entity to another. The recapitalization of the banks is nice, in other words, but it is hardly necessary if we believe—and most of us do—that the banks are effectively guaranteed by the local governments and ultimately the central government, and that depositors have a limited ability to withdraw their deposits from the banking system. “Cleaning up the banks” is what you need to do when lending incentives are driven primarily by market considerations, because significant amounts of bad loans substantially change the way banks operate, and almost always to the detriment of the real economy. Cleaning up the banks is much less important, however, when lending incentives are driven mainly by policy and there is widespread moral hazard. What matters is the impact of overall debt on Beijing’s ability to implement policies that work as expected, and its impact in generating economy-wide financial distress costs. The key in China, in other words, is not whether the banks have been cleaned up. It is how the losses are going to be allocated, and that remains no clearer today than it ever has been. Until the losses are allocated, they will simply show up in one form or the other of government debt. Because debt itself is constraining growth—I expect it to force economic activity to drop to less than half current levels well before the end of this decade—the debt must be written down or paid down and its costs must be allocated, the sooner the better for China. But that is of course, easier said than done. I have already discussed many times why the losses should not be allocated to the household sector or the SME sector. Allocating it to the former worsens the imbalances and makes economic activity more dependent than ever on increases in investment, to which China will soon reach limits. Allocating it to the latter would undermine the only really efficient part of the economy and so disrupt any chance China has of long-term growth. The losses also cannot be allocated to the external sector because it isn’t large enough, and it will not be allocated to the central government as long as the leadership believes it necessary to continue centralizing power. In the end, the losses can only be allocated to local governments, but that has proven politically impossible. I warn my clients that while all the excited chatter about reformist froth in the formal and informal banking sectors may seem like progress is being made or not made—and of course will have some impact on the stock selection process—in the end, they should not take their eye off the ball. China’s problem is that to keep unemployment low, the government must rely on a rising debt burden powered by surging non-productive investment. The only way to constrain the growth in the debt burden and keep unemployment from soaring is to allocate the debt-servicing and adjustments costs to whichever sector of the economy is able to bear it with the least damage to China’s longer-term economic prospects. Chinese consumers, whose spending helped underpin the first-half expansion this year, may not be able to deliver a repeat performance in the second as income growth slows. Household income growth slumped to 6.5 percent in the first six months from 7.6 percent a year earlier, data released Friday showed. Headwinds on consumer spending may increase as officials signal they will step in to curb pay gains to keep manufacturing competitive with rival nations that have cheaper production costs. As shoppers become an increasingly crucial growth driver, any erosion of their strength would weaken the ability for the consumer-led expansion to offset weakness in exports and investment. That threatens the government goal of raising gross domestic product by 6.5 percent a year through 2020 and slow the rebalancing away from factory-led growth. The conclusion is inexorable. Beijing must find a way of generating domestic demand without causing China’s debt burden to surge, which basically means it must rebalance the economy with much faster household income growth than it has managed in the recent past, and it must begin aggressively writing down overvalued assets and bad debt to the tune of as much as 25-50% of GDP without causing financial distress costs to soar. Everything else is just froth. Can China “grow out” of its debt burden? After many years of assuring the leadership that the debt burden was easy to manage and that reforms would resolve the problem of growth, economic policy advisors have still not been able to prevent the balance sheet from deterioration. They continue to promise that with the right combination of efficiency-enhancing reforms—and there seems to be a dispute among one group arguing for “demand-side” reforms and another for “supply-side” reforms—Chinese productivity will rise by enough to outpace the growth in debt. Causes all of the assets backed by the total stock of debt (which we assume to be equal to 240% of GDP) to generate 25–35% more GDP growth than they do now. Causes all assets backed by the total stock of debt (280% of GDP) to generate 50% more GDP growth than they do now. In some cases, as in Mexico in 1989, after many years of struggling unsuccessfully to implement productivity-enhancing reforms and suffering from low growth and economic stagnation, governments finally obtained explicit write-downs of the debt when the debt was restructured with partial debt forgiveness (35% of the nominal amount, in the case of Mexico). In this case, the cost of the write-down was allocated to foreign creditors, although during the many years of stagnation workers paid for financial distress costs through unemployment and suppressed wage growth. In some cases, governments never restructured their debt, and so never explicitly obtained debt forgiveness, but they did monetize the debt and so obtained implicit debt forgiveness through high levels of inflation (as was the case of Germany after 1919) or through financial repression (as was the case of China’s banking crisis at the end of the 1990s), or both (as was the case of the UK after 1945), in which the cost of writing down the debt was mostly absorbed by household savers. This last point is important because it creates a great deal of confusion among analysts who think that China can resolve its debt problem the same way it did fifteen years ago. China effectively forced the debt-servicing cost onto household savers mostly during the first decade of this century. With nominal GDP growth ranging between 16% and 20% and a GDP deflator between 8% and 10%, lending rates should have probably been at least 13-15%, but instead they were set much lower, between 6% and 7%, and deposit rates even lower, between 2.5% and 3.5%. Negative real lending rates effectively granted insolvent borrowers debt forgiveness every year equal to at least 6–9 percentage points for a decade or longer. Depositors effectively paid for the full amount of the debt write-down as well as to recapitalize the banks. Forcing the cost of the write-down onto household savers worsened China’s imbalances significantly, however. The household consumption share of GDP fell from a very low 46% in 2000 to an astonishing 35% in 2010. This was not a coincidence. In other cases in which governments never defaulted or restructured their debt—and so never explicitly obtained debt forgiveness—they implicitly wrote down the debt not by monetizing it but by means that involved allocating the costs to the wealthy in the form of expropriation or to workers in the former of wage suppression. Finally, in other cases—the most obvious example being Japan after 1990 and now parts of Europe after the 2009 financial crisis—governments never explicitly or implicitly wrote down the debt, and have instead spent many unsuccessful years attempting to implement reforms that will allow them to grow their ways out of their debt burdens. They have failed so far to do so, and after so many years, it is hard to see how they will succeed. Debt must be paid down or written down explicitly, or it will be implicitly amortized over time in an unplanned way and at great cost to the economy. A fundamental part of Beijing’s reform strategy, in other words, must be to reduce the debt burden as quickly as it is politically able in order to minimize the economic costs of economic adjustment and to allow for the most rapid economic recuperation. Reducing the debt burden means selecting the sectors of economy that are best able politically or economically to absorb the cost, and forcing them to absorb the cost of the debt write-down, however reluctant they are to do so. Creditors. Creditors are forced to absorb the losses associated with writing down the debt when the borrower defaults on its debt and restructures it with a principle or interest reduction. Much of China’s debt burden has been extended through the banking sector, however, and because the debt that must be written down exceeds the banking industry’s capital base, ultimately the cost will be passed on to some other economic sector—for example, Chinese households ultimately absorbed the cost of the banking sector losses generated in the late 1990s. The external sector. To pass on costs to foreigners requires that they have significantly larger exposure to China than they actually do, and would also probably require defaulting on debt—a path Beijing is unlikely to choose to follow. Ordinary households. Most banking crises, like the recent US and European crises and the Chinese banking crisis at the end of the 1990s, are resolved by hidden transfer mechanisms that pass the cost of writing down debt to households. China today, however, must increase household wealth, not reduce it, if consumption is to rise fast enough to allow investment to decelerate. This process will be explained in more detail further on, but it means ordinary households cannot be allowed to absorb the cost. Wealthy households. Given high levels of income inequality and the low propensity to consume of the wealthy, forcing them to absorb the costs of writing down debt—in the form of highly progressive income taxes, for example—is likely to be among the less costly ways economically for Beijing to pass on the costs of paying down debt. As their income or wealth is reduced, the wealthy are likely to convert most of that reduction into lower savings and very little of it into lower consumption, thus minimizing its adverse impact on domestic demand. Small and medium enterprises. Chinese SMEs are among the most efficient economic entities in China and are likely to be the main source of innovation and value creation in the future. Their long-term success is vital to China’s long-term growth. Like ordinary households they should be protected from absorbing the costs of Beijing’s debt-management policies. Local and provincial governments. These have amassed a considerable amount of assets whose liquidation would most efficiently absorb debt write-down costs and would entail the lowest medium and long-term costs. As their assets are liquidated, total Chinese savings will decline and Chinese consumption will remain largely unchanged, thus minimizing the adverse impact on domestic demand. The central government. Beijing too could pay for the cost of writing down debt by liquidating central government assets, although this may conflict with other economic policy objectives, including overcoming vested-interest opposition to the reforms. These are the major sectors of the Chinese economy within which the cost of debt-management policies can be absorbed, and although there is likely to be a great deal of reluctance on their parts, the most efficient way economically is for the costs to be underwritten by the liquidation of local and provincial government assets and, perhaps to a lesser extent, by taxes on very wealthy households. Chinese borrowers can default or otherwise restructure debt such that the cost of the write-down is allocated to creditors in the form of a haircut on the debt. Because the creditors for the most part are the banks, which are insufficiently capitalized to bear the full brunt of the losses, these losses will still have to be allocated to some sector of the economy. If the regulators avoid defaults, there are three further potential outcomes. First, the authorities can implement efficiency-enhancing reforms that cause economic productivity to surge to the point at which excess debt-servicing costs can be covered by the additional productivity. Second, the authorities can implement reforms that specifically assign excess debt-servicing costs to targeted economic sectors in order to minimize the economic or political costs. For example, it can force local governments to liquidate assets, or it can use taxes to appropriate the wealth of the economic elite—the proceeds of which are then used to absorb excess debt-servicing costs. Finally, if the authorities do not move quickly enough, excess debt-servicing costs, along with financial distress costs, will be allocated to those least able to protect their interests once debt-capacity limits are reached. There are many ways these costs can be allocated in an unplanned way. One way, and among the most likely, is if the debt is effectively monetized by continuous rolling-over of principle and accommodative monetary policy. While part of the cost may be paid out of an increase in productivity, this is likely to be a small part and can only happen to the extent that unemployment is already very high and the costs of increased production are low. Otherwise, eventually either financial repression or unexpected inflation (with the former more likely than the latter because of the structure of debt in China) will force most of the costs onto household savers and others who are long nominal monetary assets, while unemployment and real wage suppression will force additional financial distress costs onto workers. Put simply, to the extent that Beijing refuses to follow the first path—and cannot follow the second—it must choose the third path or eventually the fourth will be imposed. Contrary to what many believe, the PBoC cannot simply monetize the debt. There seems, however, to be a huge amount of confusion about why it cannot. The standard objection is that “China’s ability to monetize this debt will only severely hurt households if it results in a hyperinflation.” This is simply not true, and reflects a misunderstanding of economies whose financial systems are structured in a very different way than that of most Western countries, especially the US. Donald Trump is enjoying his strongest position in the presidential race since immediately after his nominating convention and, for the first time, has started to significantly close the gap with Hillary Clinton on the question of which candidate voters expect will win — a shift that could boost turnout on both sides. The nominees have moved up and down in polls over the summer and into the fall, but until now, large majorities of voters, regardless of whom they supported, expected to see Clinton win. That’s now changed, according to the USC Dornsife/Los Angeles Times Daybreak tracking poll of the election. Although Clinton still holds an edge on that question, Trump has narrowed it to the point that the results are within the poll’s margin of error. The voter expectations question is important because it often — although not always — has proved a more accurate way to forecast elections than asking which candidate a person plans to vote for. The expectations question has an especially good track record when an election remains a ways off — seven weeks in this case. Clinton leads 50% to 45% on the question of which candidate people expect will win, the Daybreak poll finds. That’s down from her 13-point lead just a week ago. Liberal Democrats were particularly likely to shift their view of the race, the poll found — a result that would probably come as no surprise at Clinton’s campaign headquarters, which hears constantly from anxiety-ridden Democrats bearing advice. A week ago, 1 in 4 liberal Democrats thought Trump would win the election. That’s now risen to 1 in 3. Younger voters and those without a college education were also more likely to predict Trump as the winner. Over that period, Trump has jumped ahead on the question of which candidate respondents support. He now leads 48% to 41% in the Daybreak poll. The Daybreak poll has consistently shown more favorable results for Trump on the horse-race question than many other surveys. On average, recent surveys continue to show Clinton leading by a small margin nationally. Some analysts believe parts of the Daybreak poll’s methodology tilt the results by a few points toward the Republican candidate. Whether that’s so won’t be known until the election results are in, but regardless of the level of support for the two candidates, the same trend of improvement for Trump and decline for Clinton appeared in other national and state surveys taken last week. The week was dominated by news about Clinton’s health: The former secretary of State appeared close to collapse while being helped into a van after attending a Sept. 11 memorial, then disclosed that she was being treated for pneumonia. A survey by the online polling organization YouGov for the Economist indicated how those events affected public opinion. Americans were evenly divided on the question of whether Clinton was “in good enough physical condition to serve effectively as president for the next four years,” the poll found, with just under 4 in 10 Americans on either side of that question. That was a sharp change from earlier in September, when more than half of Americans said in a YouGov survey that Clinton was in good enough physical condition and only about one-third said she was not. The shift came mostly among Democrats and to a lesser extent among independents, the YouGov poll found. A large majority of Republicans already professed a belief that Clinton’s health was not good enough for her to serve four years — an assertion that has been a staple in GOP campaign rhetoric and on conservative media for months. Concern over Clinton’s health may fade now that she is back on the campaign trail, appearing fit. That could be especially true if she appears vigorous in the first televised debate, scheduled to take place in a week. Other trends in the electorate help Clinton. In the aftermath of last week’s census report that personal incomes rose in 2015 at the fastest rate in decades and poverty fell, also by a record amount, the share of Americans saying that the country is on the “right track” has risen in some surveys. President Obama’s approval rating also continues to rise. Both of those shifts normally could be expected to boost his party’s candidate. Moreover, both Gallup and the YouGov survey show some improvement in Clinton’s standing with the electorate. Her net favorable rating — the share of voters who have a positive view minus the share having a negative view — remains poor, but is on a slight upward trajectory in both surveys. For now, however, health concerns could be one important factor driving a shift that the Daybreak poll has found over the last week: a decline in Clinton supporters’ estimates of how likely they are to vote. The Daybreak poll, unlike other surveys, asks respondents to rate on a 0-100 scale their likelihood of voting for Clinton, Trump or another candidate and, separately, to rate their likelihood of voting. Because the poll surveys the same set of roughly 3,000 people each week, it allows a more precise look at how people are making up their minds. Since Clinton’s health problems began dominating the news, her supporters’ average likelihood of voting has dropped 2 percentage points while Trump supporters’ likelihood has risen by a point. That shift is small in numerical terms but can make a big difference in a close race. Among the groups showing the biggest declines in likelihood of voting over the last week have been moderate Democrats and liberal independents. Both groups might be expected to include less motivated supporters of Clinton. Conversely, among moderate independents, those who support Trump showed an increased likelihood to vote, the poll found. The increased likelihood of voting on the part of some Trump supporters could also come from their reaction to Clinton’s remark a little more than a week ago that half of Trump’s supporters fit into what she termed a “basket of deplorables” who display sexism, racism, homophobia and other negative motivations. Clinton apologized for the word “half.” Republicans have used the “deplorable” label as a rallying cry. Meantime, the shift in voter expectation about which candidate can win could help boost turnout for both. Trump’s lead in the Daybreak poll rests in part on support from disaffected, conservative white voters who did not vote in 2012, but say they plan to vote this time. A belief that Trump can win might help motivate those voters to the polls, and his campaign manager, Kellyanne Conway, repeatedly has trumpeted the “momentum” on her side. Overall, however, the Daybreak poll indicates that Clinton probably has the most to gain from expanded turnout. Trump has led among poll respondents who say they are most sure of their decision and most certain to vote. Clinton led until the last week among the larger universe that includes potential voters who are somewhat uncertain about their choice or their likelihood of casting a ballot. In particular, Clinton has had trouble gaining the support of younger voters. Those voters prefer Clinton and even the Libertarian nominee, Gary Johnson, over Trump, according to some surveys, including a recent SurveyMonkey poll of California voters done for USC and The Times. But Democratic strategists have worried that some of those younger voters might cast a ballot for Johnson or Green Party nominee Jill Stein in the belief that Clinton will win regardless. They’ve also worried about younger voters staying home. Tighter polls and a rising belief that Trump can win could help with those problems. Obama addressed that issue in a passionate speech Saturday night to the Congressional Black Caucus gala in Washington. “There’s no such thing as a vote that doesn’t matter,” he said. “After we have achieved historic turnout in 2008 and 2012, especially in the African American community, I will consider it a personal insult, an insult to my legacy, if this community lets down its guard and fails to activate itself in this election.